Picture from unidentified source. Help requested. This entry is based on a fascinating article by Angeliki Tzavara and Thierry Ganchou which can be downloaded and read here. Although it was published in 1999-2000, I have only just seen it through the magic of the Academia website, and as far as I can tell from 6 years of Morea research, it has been quite thoroughly ignored. Tzavara and Ganchou found a document in the Venetian archives which clearly identifies a second wife for Theodoros I of Mistra. That the sole source is Venetian is another reminder of Byzantine misogyny in the imperial family. It may be remembered that Manuel's daughters have gone completely missing, as has his wife's mother, some of his grandchildren and others. Theodoros is known to have been married to Bartolomea Acciaiuoli, daughter of Nerio Acciaiuoli of Corinth and Athens. It will be recalled that Chalkokondyles said she was one of the most beautiful women of the age. She may have been, but there is no reason to rely completely on Chalkokondyles, as he also said that Nerio left Corinth to Theodoros. Nerio did not. At Nerio's death in 1394 he forgave the 5000 ducats Theodoros owed him, but left essentially everything to his other daughter Francesca who was married to Carlo Tocco. Carlo Tocco took possession of Corinth. Theodoros went to war for Corinth, and eventually gained possession. Nothing is known of what happened to Bartolomea, but she probably died after 1396. Theodoros died of gout in June 1407. Manuel II went to Mistra immediately and created his young son Theodoros Despot. Manuel and his brother had him in Mistra already, so there would be no doubt about the inheritance. Manuel's long funeral hagiography for Theodoros never mentions any marriages or children. 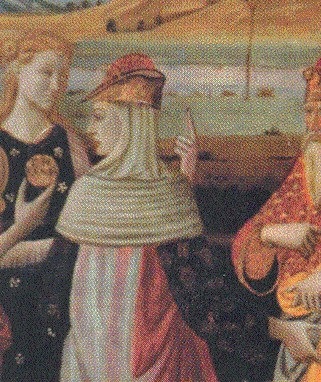 The second wife appears in a Venetian document of 1412, five years after Theodoros died. In it, a judge on Rhodes appoints a procurator to act on her behalf to collect money owed her there. 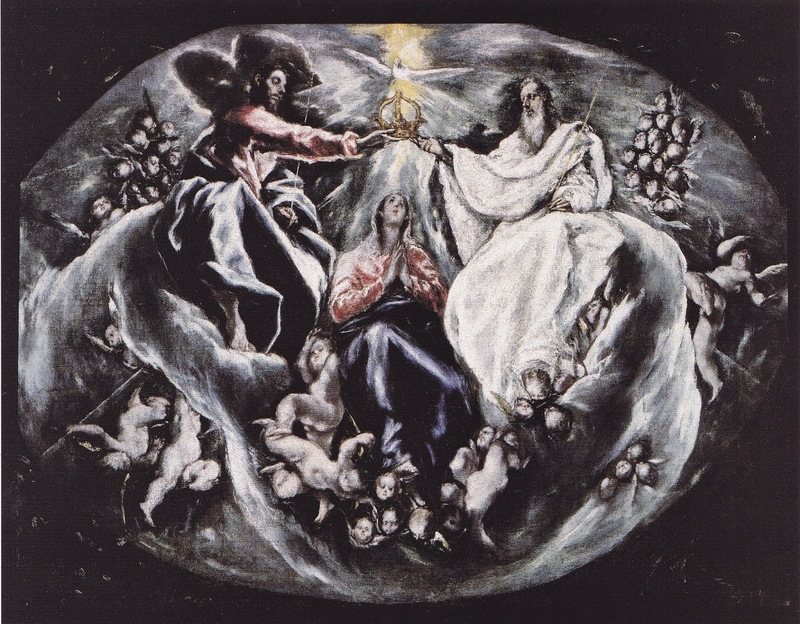 This is how she is described: "illustrissima principissa et domina domina Caterina Palaiologina, relicta bone memorie serenissimi principis et domini domini Th. despotis Amoree . . . (by the) most illustrious princess and lady, Lady Caterina Palaiologina, widow of the prince and lord, Lord Theodoros, Despot of the Morea of good memory." That is all we have, but the combined Rhodian and Venetian legal systems were not likely to have invented an imperial wife. "Long afterward, Oedipus, old and blinded, walked the roads. He smelled a familiar smell. 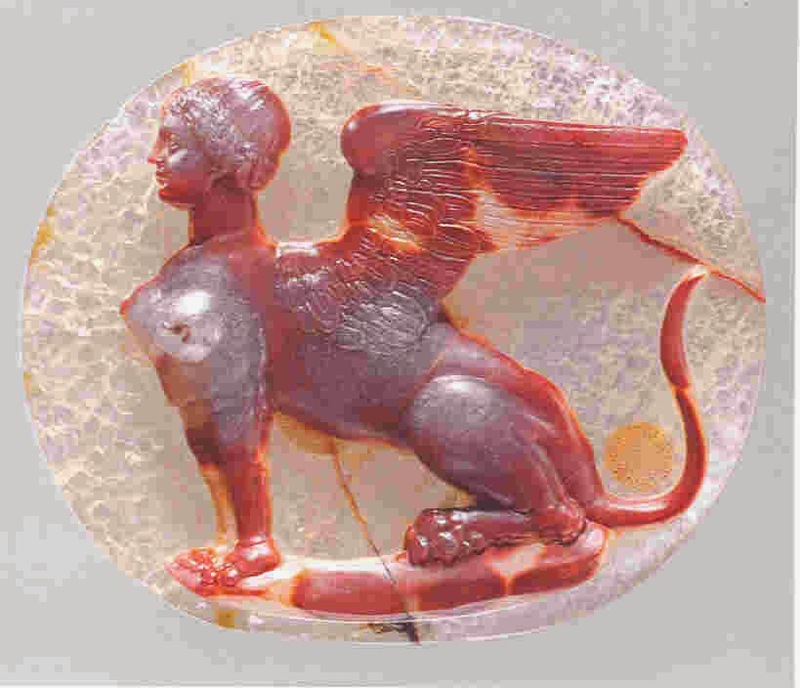 It was the Sphinx. Oedipus said, "I want to ask you one question. Why didn't I recognize my mother?" "You gave the wrong answer," said the Sphinx. "But that was what made everything possible," said Oedipus. "No," she said. "When I asked, What walks on four legs in the morning, two at noon, and three in the evening, you answered, Man. You didn't say anything about woman." "When you say Man," said Oedipus, "you include women too. Everyone knows that." She said, "That’s what you think."" Domenikos Theotokopoulos, Coronation of the Virgin. ca. 1605. Athens, Alexander S. Onassis Foundation Collection. These are souls in Abraham's bosom, but it is the closest image I can find for τατα. -τατα might be part of a missing word, I have only found six incidents in the TLG that seem to be what I want. What I wanted originally was the sense of τατα intended when Sphrantzes says his father was τατα to young Thomas Palaiologos and his uncle was τατα to Constantine. Doukas tells a story in which Mehmed calls for Halil Pasha in the middle of the night. Halil thought this could only be fatal, and made his farewells to his wife and children. He went to Mehmed. "Lala," Mehmed says, and Doukas explains that this means the same as τατα, which he over-glosses as παιδαγωγέ. "Lala," says Mehmed, "I want you to give me The City." It is not often you catch Mehmed making a joke, but here he is acting the child, asking for a present. It makes me think -- with no justification -- of the time when Sphrantzes asked Manuel II for a present. When Sphrantzes' father died, Manuel put Sphranzes in charge of his wardrobe. Sphrantzes once asked Manuel for a particular antique chest. (And this is where I imagine him impulsively calling Manuel, "Τατα.") Manuel's first response was that he had the chest from his father, the emperor John, and he planned to give it to his son, the emperor John. But he gave it to Sphrantzes. Nothing in Sphrantzes' narrative allows me to insert Τατα into the story. In Characters, 7, Theophrastos speaks of older children teasing their father, a compulsive talker, who, when they want to sleep, say, "Babble something at us, τατα, to make us feel sleepy."
. . . for you would not go with another out to any feast, nor taste any food in your own halls until I had set you on my knees and cut little pieces from the meat, and given you all you wished, and held the wine for you.And many times you soaked the shirt that was on my body with wine you would spit up in the troublesomeness of your childhood." In the Liddell & Scott lexicon, τατα is referred to τέττα in Homer and explained as a term of affection towards an older male. Homer's sole use is for Diomedes in Iliad 4 speaking to Sthenelos (Sthenelos?) who is an older male. Aristophanes collects these and other similar words into a list, "ἄππα, πάππα, μάμμα, μάμμη, μαμμία, τέττα / ἄττα." Ἄττα is essentially the same word as τατα. Achilles uses ἄττα for Phoinix, and Telemachos uses ἄττα for Eumaios, even after he knows who Odysseus actually is. Odysseus had left home by the time he was able to say the word. The Vita of S. Marina speaks of a hungry child crying "Τατα, and other such things the way children do." Similarly, Tzetzes, writing about how he always uses the appropriate language for the person to whom he is speaking, says that he uses μάμμα and τατα with small children. Τατα does not always get the result one might hope. Ioannes Antiochenos tells a story of Phokas saying, "Bring me my τατα." 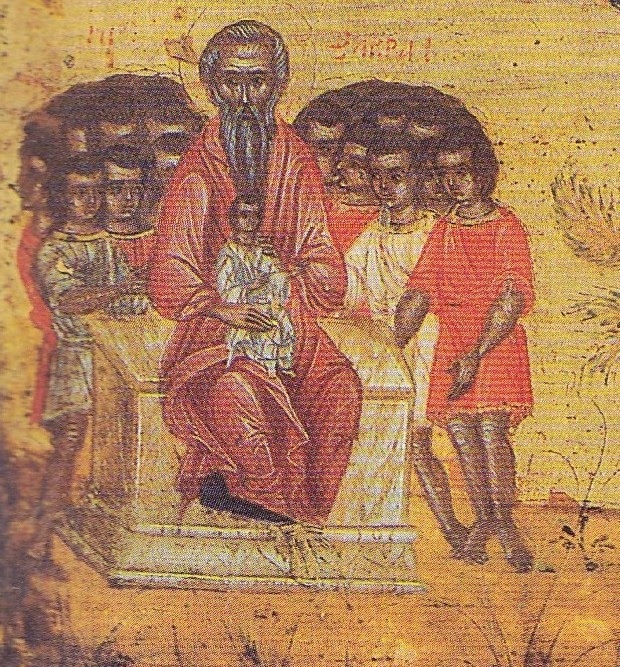 The τατα was brought, and Phokas cut off his head. We will not speculate as to the reason. One of the loveliest of all saints' lives, that of Philaretos, tells of the dream of his small grandson Niketas, after his death. Niketas saw his grandfather in the place of Abraham in a world of great joy and light, and woke up crying because he had to leave "the sweet light." "I wanted," he said, to be with my τατα and my πάππου -- my daddy and my grandfather."